So I recently whipped out my copy of Ozzy Osbourne’s Tribute album, a fantastic live release dedicated to the memory of Randy Rhoads, and finally noticed what appears to be a hand written lesson on extended 9th chord arpeggios in one of the picture collages. 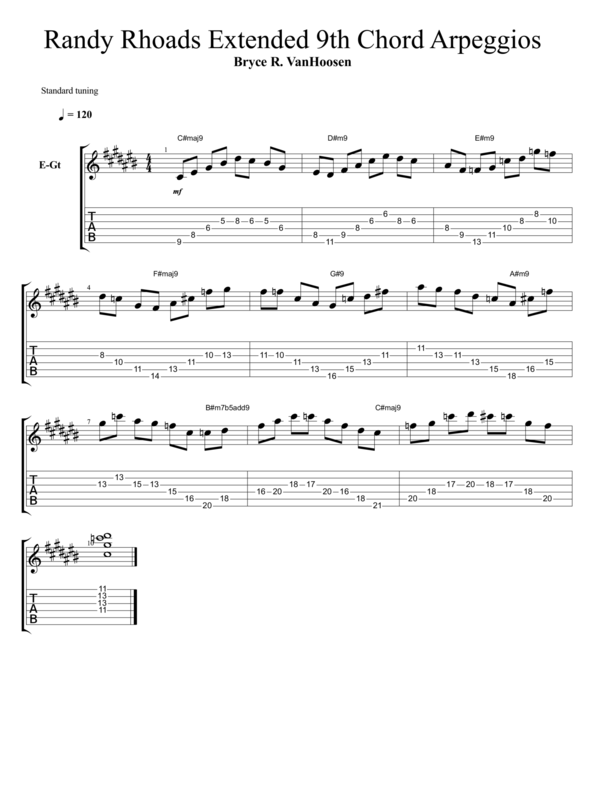 This was a perfectly timed discovery, as I’ve been spending a lot of time with Al Di Meola’s 7th arpeggio fingerings – so why not add some 9th arpeggios into the mix as well? A note on naming conventions for the beginner – a 9th chord is what happens when we add a 2nd to a chord an octave higher. In the C# Major scale the degrees are C#(1) D#(2) E#/F(3) F#(4) G#(5) A#(6) B#/C(7) C#(8 – octave). When we add a D# to a C# major chord – and that D# is an octave higher than the other D# you could have played (the 2nd) – it’s called a 9th. For some reason the 9th sounds much more melodic than the 2nd. I’ll talk more about intervals in the coming weeks. In the mean time I’ve attached a PDF TAB translation of Randy’s standard notation. You’ll notice that the major and minor arpeggio shapes don’t change as you move them up in the scale – that means you can move these shapes around and use them in your soloing and improvisation once you’ve committed them to memory. Leave your questions and comments in the section below!